Herbalife Ltd, a US-based firm that sells weight-loss shakes and nutritional supplements, announced the opening of its first research and development (R&D) centre in India in Bengaluru in partnership with Biocon Ltd’s research services arm Syngene International Ltd. The new centre will house a group of Syngene scientists who will work closely with Herbalife on product development, sensory evaluation and testing among other services. The 3,000 sq ft facility is located inside Bengaluru-based Syngene’s campus and is Herbalife’s fourth such lab worldwide. Its new lab in the city will house a group of Syngene scientists who will work closely with Herbalife on product development, sensory evaluation and testing and scientific content writing among other services. The nutrition R&D lab will house a group of Syngene scientists that will work for Herbalife Nutrition on various research and development projects. Herbalife will work closely with Syngene in the areas of R&D in the field of nutrition - including product development, sensory evaluation and testing, scientific content writing pertaining to nutritional products and supplements, project management, formulation development, analytical service, stability study and other related services - and ensure that the right systems and processes are followed to deliver nutrition products for Herbalife India. “At Syngene, we are committed to developing products that enable people to lead healthier lives. We see many synergies in this association and feel it is natural for us to partner with Herbalife Nutrition to help them in their quest of advancing better nutrition,” said Kiran Mazumdar-Shaw, managing director and chairperson of Biocon. Syngene has set up similar exclusive R&D centres for other global biotechnology firms in the past, including Amgen Inc, Bristol-Myers Squibb, Abbott Nutrition and Baxter Inc.
“I think when we look at these we need to basically cater to a prospect of expansion,” Mazumdar-Shaw said when asked why Syngene was partnering with Herbalife to set up an exclusive R&D centre. The partnerships are decided based on understanding where the capabilities and expertise are and not by a bidding process, said Manoj Nerurkar chief operating officer of Syngene. India is among the top five markets for Herbalife, which has for long been at the heart of a battle between US activist investors Bill Ackman and Carl Icahn, with Ackman saying the company is an illegal pyramid scheme guised as a multi-level marketing firm and Icahn challenging his claim. 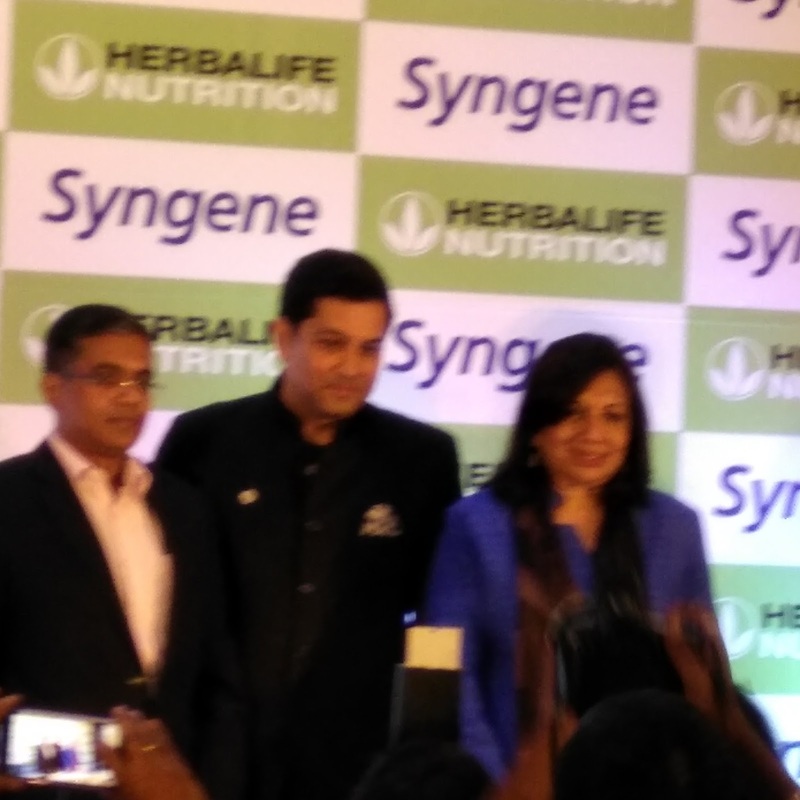 When asked on a question on the numerous lawsuits and complaints filed against the parent company in regards to side effects on using some of the Herbalife products, Ajay Khanna, vice president and country head of Herbalife International India Pvt Ltd said, "we have just began our partnership with Syngene and in the next few months bring out products made for the Indian market. The lawsuits and complaints filed were against the parent firm and no such problems have been witnessed in India so far". The nutraceutical market in India is poised for tremendous growth. Currently the market is about Rs 2.2 billion (Rs 220 crore) and is expected to grow to Rs 6.2 billion by 2020. This is a further commitment to the consumers in India to have the R&D lab so that we can bring products from our global portfolio much faster into the country,” said Khanna. Khanna said a substantial amount of investment had gone into setting up the facility in Bengaluru, however did not divulge on the actual amount invested in the facility.